I just took a walk through my house counting...as it turns out I have 84 cookbooks. But what I don't have is "Mastering the Art of French Cooking," the book that the entire movie is about. I am floating right now! What a fabulous movie for someone who loves not just cooking, but reading cookbooks. I tried reading the book "Julie and Julia" a few months ago and ended up putting it down because I just plain didn't like Julie Powell, the author. It's a rare thing for me to give up on a book, and I was disappointed because I was so sure I was going to love it. But I was still so excited about the movie and it did NOT disappoint. Tonight I fell in love with Julia Child. I remember my grandmother watching her on PBS once in a while when I was kid, way before the Food Network appeared on the scene and took over my existence. But I never paid much attention to her. 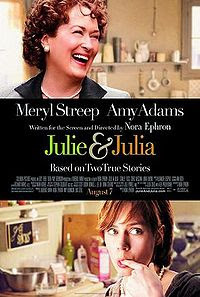 What an amazing woman she was, and who better to portray such an eccentric and lovable persona than Meryl Streep. I also don't have enough good to say about Stanley Tucci, who plays Julia's husband, Paul. They were so in love and fun to watch. I was laughing hysterically as Julia and Paul cried while she sliced mountains of onions. West Virginiaaa...mountain mommaaa...take me hooooome...country roads. I'm home from one of the most wonderful experiences of my life. I went to Northfork, WV and worked with an organization called Mustardseeds and Moutains to do home repair and build relationships with people in that county. I'll be blogging about it all once I get home from my MN trip to visit the Millers. But I wanted to take a minute to proclaim how much I love my beautiful kids and my wonderful husband. When I walked into my house it was SPOTLESS!!! It was vacuumed, dusted, dishes done, laundry done, folded, and put away. And places that tend to collect Mark's day to day clutter were completely empty. The kids had made me cards that were set up on the dining room table. On top of it all, Mark made dinner, did the dishes, and gave the kids baths for ANOTHER night, even though I'm home now. I am so thankful for them all. So now I'm off to visit friends and will be gone for another week, but I am saying thank you again, to the people who helped support me going on this trip. It truly was life changing and I can't wait to go back! The picture above is our team from NewLife Community Church at the house where we stayed on our trip. So we all know that I love movies. I feel like my taste in movies is even diverse. I love blockbuster hits, I love indies, I love comedy, drama, romance, horror...I'll watch anything (except maybe Chuck Norris/Steven Segal stuff cuz it's just boring). Something that amazes me though is that for all the movies out there, one movie that I never fail to stop and watch when I catch it on TV is Tommy Boy. It has me cracking up through the whole thing. It's so stupid, but it's HILARIOUS!!! Anyway, this got me to thinking--what are my other guilty pleasures? What are the movies that I truly love and watch over and over, but wouldn't want to admit to fellow movies buffs and especially not to a critic? Hmmm, I'll mull it over and post again on this topic. Every summer is a big deal for movie goers. There are always a few I look forward to seeing, but this year seems exceptional. Thank goodness I’m having a yard sale this weekend because I will be spending oodles of money on movies during the next few months. So, if you’re interested, here’s what is on my personal must-see list, by release date, and keep in mind that May is considered part of the summer movie season. ANGELS AND DEMONS – May 15 – Loved the Davinci Code so on to the next big story, right? THE BROTHERS BLOOM – May 29 – Looks creatively hilarious. UP – May 29 – The kids and I never miss the summer Disney/Pixar. MY LIFE IN RUINS – June 5 – It’s set in Greece, any questions? AWAY WE GO – June 5 – One of my most anticipated…John Krasinski and Maya Rudolph…looks beyond fabulous. 500 DAYS OF SUMMER – July 17 – Looks different than anything else I’ve seen, and I love that. MY SISTER’S KEEPER – June 26 – Will be sobbing from start to finish but I don’t want to miss it. HARRY POTTER AND THE HALF BLOOD PRINCE – July 15 – Yaaaaaaaayyyyyyyy!!!!!!!!!!! G.I.JOE: RISE OF THE COBRA – Aug 7 – Because I was a kid in the 80’s and watched this cartoon daily. TAKING WOODSTOCK – Aug 14 – Most people who have known me well call me a hippie at heart…nuff said! POST GRAD SURVIVAL GUIDE – Aug 14 – Being a fan of Gilmore Girls it’s nice to see Alexis Bledel get a shot in her own leading role. THE TIME TRAVELER’S WIFE – Aug 14 – I haven’t found a trailer for this yet, but just the story alone looks amazing…based on a novel, which is usually a good sign. THE BOAT THAT ROCKED – Aug 28 – Radio dj’s introducing rock to Britain in the 60’s…AWE(wait for it)SOME! Of course my most anticipated movie of the year isn’t until November 20, but that’s another post for another time! I have a conundrum. Star Trek...to see or not to see? Okay so I was watching Movie Mob on Reelz channel today. For anyone who hasn't seen this show it's a very entertaining way to watch movie reviews. 9 different people go to see the latest movies and then review them on their webcams. They create these funny names and personalities and it's sometimes very funny and sometimes very annoying, but I'm hooked. Each week you can go online and vote for your favorite movie reviewer and the person with the least votes gets kicked off the show and a new one comes in next week. It's just an ongoing thing...not a competition show or anything. I never vote, but I do manage to catch the show every week as it is on multiple times all week long. Anyway all that to say, because this show has such diverse personalities, the reviews are always inconsistent and all over the place. Some people love what other people hate, as is usual in life. HOWEVER...today every person reviewing Star Trek LOVED IT! It got 4 or 5 stars from everyone and I was so surprised by that. The other common comment between them all was that it MUST be seen on the big screen. Star Trek is one of those major blockbuster movies that I wasn't all that interested in, and probably would have seen it as a rental. I might have even waited until it showed up on TBS or FX or something. But now that the whole world is loving this thing, I'm left wondering...Am I missing out on a major movie going experience? Should I spend the $9 to see this on the big screen? Thoughts? 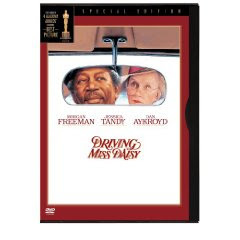 Driving Miss Daisy is 20 years old, which means I was around 12 when it was released. It's kind of hard to believe I hadn't ever seen it, especially since it's on tv constantly. But the fact that it won an Oscar for Best Picture made me want to wait and watch it with no commercials. So last week I finally sat down with my library rental and gave it a try. I loved it! What a sweet story. I was already a fan of Jessica Tandy because of Fried Green Tomatoes which is easily on my top ten favorite movies of all time list. And I don't know a soul who doesn't love Morgan Freeman, so it already had a good cast going for it, but the story easily drew me in and left me feeling just a little sad, but very content and with a warmed heart. If you haven't ever seen this absolute American classic, give it a try on a lazy afternoon or evening and enjoy. This weekend Mark was away so it was the perfect opportunity to rent a TON of movies. I got to see “Changeling” and “Rachel Getting Married” with two friends during a very late night involving junk food. Two heavy movies for a girls' night, but it worked. And then I also saw “The Other Boleyn Girl,” “Definitely Maybe,” “Penelope,” and “Eternal Sunshine of the Spotless Mind.” Lots of different genres…that’s a good weekend. “Rachel Getting Married” was the standout to me in this collection. This was Anne Hathaway’s first Oscar-nominated role and let me say, rightfully so. I’ve only ever seen her play the good girl. In this she plays Kim, a recovering addict who comes home for her sister’s wedding. It was almost more of a study on family, rather than a story. There was no heroine or villain in this movie. I could feel pain for each character, and I also felt angry at each character at different times. It was very raw…from the awkward rehearsal dinner toast, to the mother’s withdrawal from her own daughters, to the dad trying desperately to hold his family together, to Rachel one minute hating her sister, but the next minute caring for her as only a sister can. Anne Hathaway was perfection. She’s an actress for the ages in my book. As a side note, I also really enjoyed the uniqueness of the wedding and the eclectic group of friends throughout the movie. Also, the wedding musicians were always around the house, practicing for the big event, but that provided the movie soundtrack. It was pretty cool. So after finally viewing “V for Vendetta,” I realize it falls into the category of movies that takes over every male of my generation’s psyche…movies including Gladiator, Braveheart, and of course, The Matrix. What is it about guys and the rebel mind set?…fighting for a cause…etc, etc. Speaking as someone who never wants to hold a weapon in my hand, I suppose I’m glad there are actual Robin Hoods out there who are willing to stand up for freedom and what’s right. Especially considering how crazy our world is becoming. Funny what a serious tone this has taken, all because of a story from a graphic novel. But a good movie, whether it's based on reality or fantasy, allows you to experience something you otherwise wouldn’t, right? Just throwing a quick warning in though, since I know some of the people who read this and take my movie suggestions: it’s slightly disturbing in a holocaust kind of way. But if you’re up for it, it’s worth seeing. Wow Wow Wow!!! In the past couple of weeks I saw two movies (well, lots more than two, but I’m talking about a specific two here). 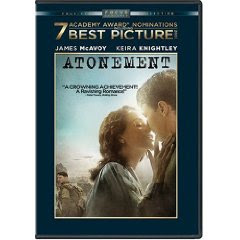 “Atonement” had a trailer for “Miss Pettigrew Lives For a Day” and “Miss Pettigrew Lives For a Day” had a trailer for “Atonement.” These are two completely different kinds of stories. I’m not saying trailers always show similar movies to the one you’re watching, but they do tend to show chick flick trailers on chick flick DVD’s, and shoot-em-up trailers on shoot-em-ups…you get my drift. I supposed it mostly has to do with the actual production company promoting their own movies. Anyway, here are my observations on these two movies. Both were based in England. One was a comedy, the other a drama, well tragedy may be a more likely word. Both had superb acting, so I suppose they also had that in common. I love anything with Frances McDormand (my favorite character being the somewhat wacky but conventional mother in “Almost Famous”). I also feel you can’t go wrong with Amy Adams, James McAvoy, Vanessa Redgrave, or Keira Knightly. The thing that stood out the most about both though, was the music. I loved how an old typewriter was used to build suspense by tapping out specific cadences in “Atonement.” And the soundtrack of 30’s jazz in “Miss Pettigrew” is not to be missed. Definition: These are not my top 10 favorite movies. These are the top 10 movies that left me FEELING something…I sat in my seat speechless or left the theatre euphoric over the film I had just experienced. 1. Remember the Titans – Saw it with my Pennsylvania family (Mark, Jamie, Gretchen, Woody, Cliff, Ang). We all walked out of the theatre and immediately began freaking out. Left on a big high. 2. Slumdog Millionaire – Saw it with Faith. Getting through the grittiness of the Mumbai slums was so worth it as we sat speechless at the end with soaring hearts. 3. Fever Pitch – Saw it with Mark. Best date movie ever because Mark, who doesn’t like going to movies much, loved it as much as I did. Sports, romance, Jimmy Fallon humor, Red Sox winning…perfection! 4. Dan in Real Life – Saw it with Lydie. Laughed and hurt through the whole thing. Total resolution at the end…left feeling happy about life. 5. August Rush – Saw it with Lydie and Sam. Was hyperventilating and gripping the armrests during the last minutes as they came together. 6. The Curious Case of Benjamin Button – Saw it alone. Very needed as an escape that day. It fit my mood perfectly…wanted to be carried away by something not real and something that would make me feel. 7. The Other Sister – Saw it with Gretchen. Thought it looked silly, but after weeks and weeks of Gretchen begging me to go see it, I finally gave in and it was SO WORTH IT. Left theatre feeling euphoric about life. 8. Reign Over Me – Saw it with Kristen. Basically having convulsions trying not to sob out loud. Will probably never see it again because it was so hard to get through, but glad I saw it once. 10. Stepmom and Patch Adams – Saw them with Gretchen. Tied because we cried so hard at the end of both. Okay, another blog tag. I was told to list my personal Top 40. There's no rhyme or reason to the order because with so many different genres, I couldn't possibly figure that out. All I know is these are the songs I've been coming back to again and again for most of my adult life. 19. A Wink and a Smile - Harry Connick Jr.
No blogging for weeks, but I’ll explain if I may. I came home from Thanksgiving way too sick. But December is crazy with many tasks to lick! With no rest I got sicker—and I wasn’t faking! Finally it was all done, my house looked cheery. I could sit and enjoy the season through my eyes so bleary. Now that I'm healthy there’s fun stuff to do. Town festivals and light spotting are the first two. We’ve been watching our movies and reading our books. Got some pics of my kids with some pretty cute looks. The kids sang in big church, to name just a few. Busy busy busy, but with really fun stuff. December is magical so it never feels rough. Gifts are bought and wrapped and I can’t wait to share! But there are special times with my family that are being had. I know I indulge myself in a little bit of Christmas through November by breaking out the music and the mugs (and even some decorations if Mark will let me get away with it early). But I will admit that it is not truly the Christmas season until that cold, fresh, nothing-else-like-it smell of our balsam fir hits me for the first time. Aaaaaahhhhhh...the true smell of Christmas in my living room! When I was in college I remember my friends and I discussing what our favorite childhood Christmas record was. Yes, I am old enough to have used records as a small child. It was that one album that meant Christmas was here the moment you heard it. For one friend it was Barbara Streisand, for another Jim Reeves...you get the picture. We had a bunch that we played at our house, but my favorite by far was the Carpenters Christmas Portrait. A friend of ours was techno savvy enough in the early 80's to finally record it onto a cassette tape for us and that's what we played for years and years and years until the CD revolution, at which point (after receiving my very own CD player for Christmas), I went right out and bought my own Carpenters CD, along with one for my mom. I was thinking about this the other day. For years now we've had Christmas radio stations at our exposure. I remember as a kid the oldies station would play Christmas music all day only on Christmas and we were so excited about it every year. Something different, something fun. But now, we have stations playing Christmas music starting as soon as Halloween is over and straight through New Year's (and online all year long if you want it). Now for me, this is great because my minivan is on the old side and only has a radio and a broken casette player. So the radio being my only option, I thrive on those Christmas stations as I drive around town. Another thing those of us blessed with DirecTV have is XM radio stations through our TV. I never listen to these stations, except when Christmas comes around. It's so convenient to flip on the TV and turn it right to the Holly station for some old and new Christmas classics. But the other day as I was driving around singing Christmas songs with Rory at the top of our lungs, I realized that so far, my kids don't have that one special album that will always mean the magic of Christmas. Part of this is because of the two things I just mentioned, but another reason is because I have been a Christmas CD freak since college and at this point probably have over 40 different CD's. So if I do take the time to pop in a CD (or bring up iTunes on my laptop) instead of the radio, I'm playing a variety of music all season long, rather than just those few special albums over and over. Is there a solution? I'm determined to make December as magical for my kids as I remember it being for me. But I like ALL my music and I don't want to leave any out. Maybe I can play the same CD every year as we decorate the tree, or maybe I can play the Disney one during breakfast every morning as a happy Christmas start to the kids' day...I don't know...I'm still mulling. Suggestions are welcome. Just once again thinking out loud to anyone who wants to listen! 1) Mark doesn't like our kids to have much candy in the first place. 2) I am a self-proclaimed candy addict and it's impossible to see massive amounts of chocolate without indulging. 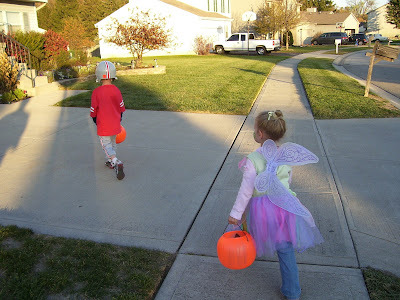 3) Our kids are getting old--we did 2 neighborhoods instead of just our development and both kids have a rediculous amount of candy. 4) If we don't help the kids eat it, it will last until January, and I personally don't even like the candy to infringe on our Christmas cookie season because there's already so much food to enjoy during December. 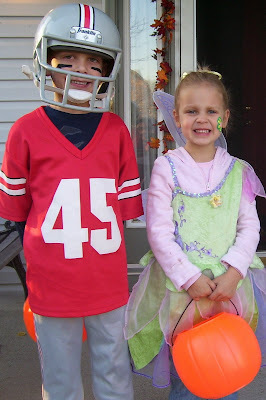 5) Isn't it the God-given right of every parent to dip into their kids Halloween buckets? I mean come on--my mom did it. It's the circle of life! I am a person of tradition. If something is done one year, it must be done the following year. My mom did it this way growing up, and I think it's just bred into me now. Although my mom does say that when we were kids, if she let something go or we skipped something, I was the one who demanded that things go the traditional way. I was not a fan of change--I think it made me feel secure and I liked knowing that our family did things certain ways. 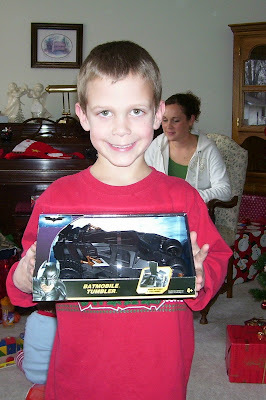 I feel it's really important to help create a feeling of security, fun, and festiveness in my kids lives, so they can look back at their childhoods and proclaim to all the world the way things were done in our family. I'm thinking this mostly pertains to holidays and special occasions, but I've seen it creep into other facets of our lives too. So in saying all this, it's hard to let go of a traditional fall activity this year, but it's with good reason. We have carved a big jack-o-lantern every year since before we had kids. Usually it's the week before Halloween. Last year we made a huge event out of it, first carving the pumpkin, then having hot chocolate with pumpkin peep marshmallows, and finishing by watching "It's the Great Pumpkin, Charlie Brown." Obviously, this is the most fabulous event in my mind because I'm so psychotic about fall, and I planned to make it an annual family evening. 21 days and counting until the constant beating over our heads that is campaign commercials comes to an end.